Japanese Street Food Tour of Tsukiji Market - 10 Best Things To Eat! 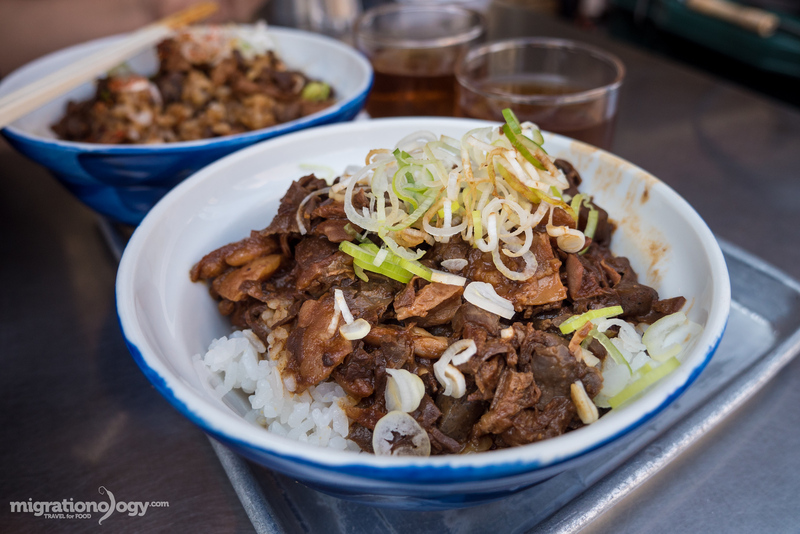 Tsukiji Market in Tokyo is one of the best places where you can try amazing Japanese street food. 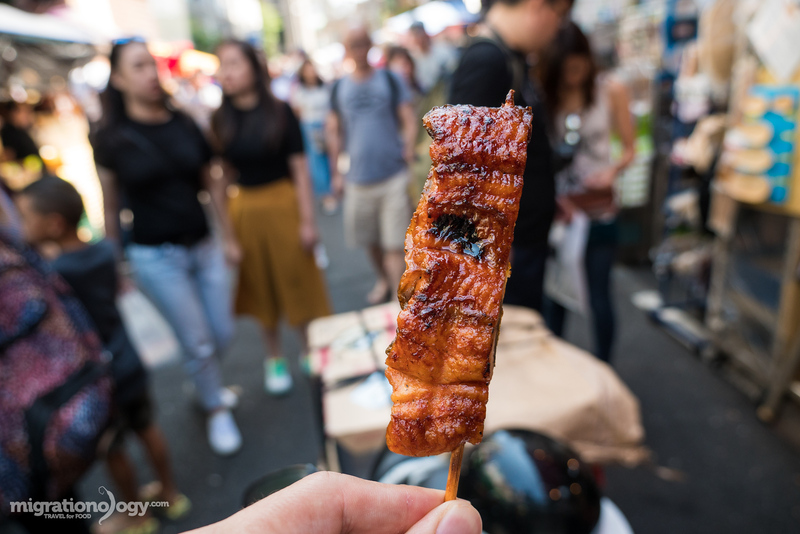 In this Japanese street food tour of Tsukiji Market, I tried a total of 10 different foods, which are all listed below with information about how and where you can eat them too. Enjoy! 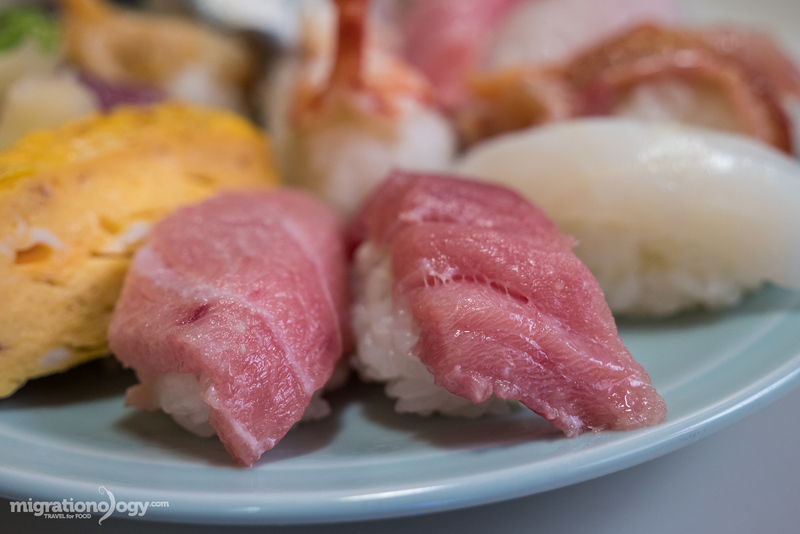 Everything within this Tsukiji Market food tour blog is within the video. Note: Sadly, there was a recent fire in the outer Tsukiji Market at a legendary ramen shop (I ate here last visit to Tokyo). Luckily no one has been reported injured from the fire, but it is very sad to see the damage. 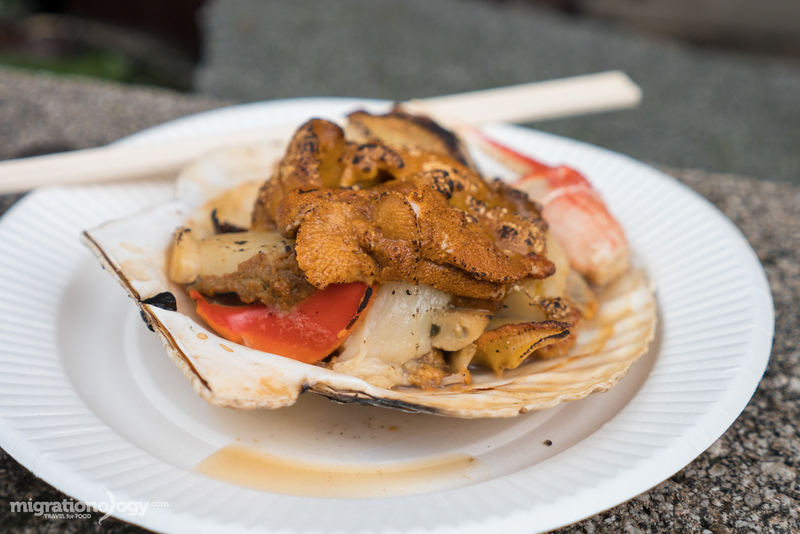 Tsukiji Market is a paradise for seafood lovers, but there’s also plenty of popular street foods to try that are far from seafood. Kitsuneya is a time tested hole in the wall shop that serves one of Tokyo’s legendary versions of a miso based stew with organs. There’s a mix of organs within the stew, lots of jiggly and oozy bits, that slow boil in what looks like one of those eternal bubbling pans. The organ stew is scooped over rice, and topped with a handful of shredded leek. I’m a big lover of organs, so I loved it. The mix of innards melts in your mouth, and the taste of the stew is slightly bitter and miso filled. If you don’t enjoy organs, they also have a beef bowl donburi you can order. 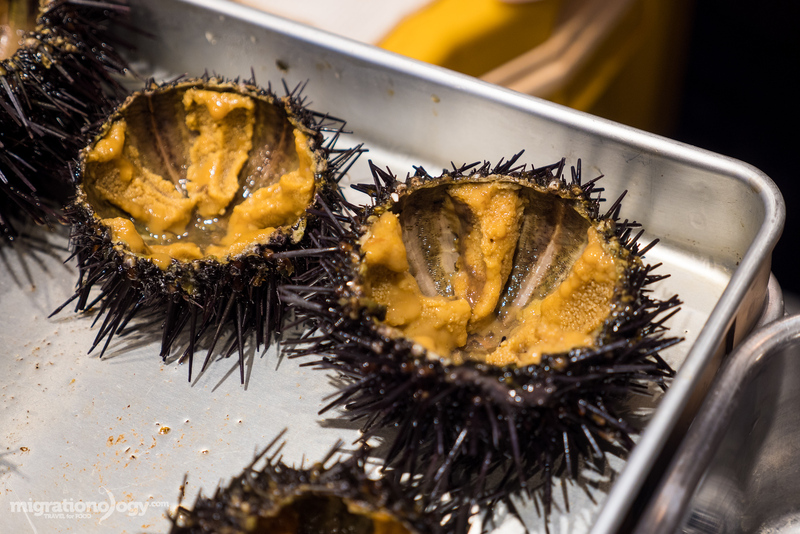 One of the greatest single bites from the sea is sea urchin, known in Japanese as uni, and highly regarded as a delicacy. The spiny dangerous looking sea urchins are cracked open, revealing the gold on the inside. Sea urchin is incredibly creamy, salty, and has a natural bitterness to it as well. The flavor is so complex. However, uni is quite seafoody, so you really need to love seafood to probably enjoy uni. You’ll find sea urchin freshly cut all over the outer Tsukiji Market. I ate mine at an all uni shop, located on the map within a lane of the outer market. Freshwater eel, known in Japan as unagi, is another delicacy in Japan. It can be very expensive and very high quality, and traditionally is grilled and served over rice in a wooden lacquer box. But at Tsukiji Market you’ll find a small stall known as Nishin Tasuke and they grill up skewers of eel in small portions so you can just buy a few skewers to nibble on. When I ordered a duo of eel skewers, we had an accident – when he handed me the skewers, one slipped off the skewer and fell to the ground. It was sad, but a testament to how soft the eel is. It’s so tender it will met in your mouth. There are a number of Japanese street food stall throughout the market that specialize in fishcake. You’ll see an assortment of different shapes and sizes, all golden brown, and with different seasonings. I’m not totally sure why the corn fishcake is so famous, but it seems to be the most popular of all the choices you have, and so I was influenced into trying it. It turned out to be really good. The fishcake itself was mild and smooth and light, while the sweet corn was caked onto the edges and even within the fishcake. You’ll find that the sweet corn is amazingly sweet. The biggest oysters I’ve ever seen! You’ve got to see these oysters in person to believe it… they are huge! Walking around Tsukiji outer market, you’ll find quite a few little stalls with freshly shucked oysters over ice waiting for you to buy. Be choosy and find ones that look nice and fresh. I had read about Tsukiji Saito Fisheries, and when I was there, it was very popular – lots of people were buying oysters. They have all different sizes you can choose from, priced according to size. Naturally, I just had to go for the biggest one they had, and it was by far the biggest oyster I’ve ever eaten. 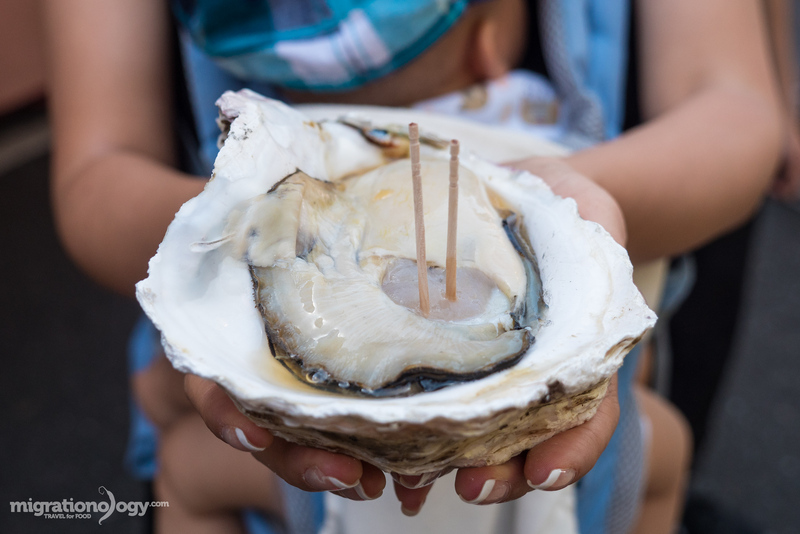 You know how you normally slurp down an oyster in a single bite? This oyster took me 3 huge mouthfuls to get down. And it was so incredibly soft I could have spread it like jam on a piece of bread. AMAZING! 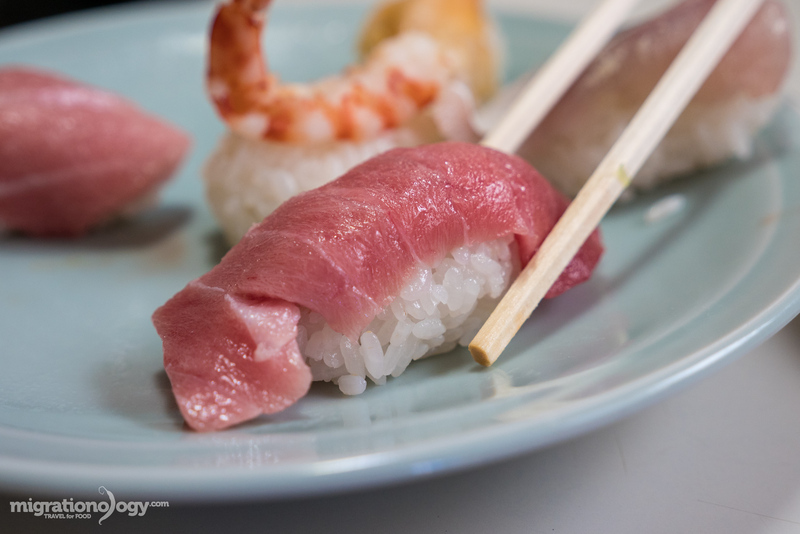 To be quite honest with you, probably the top reason that most people go to Tsukiji Market is to eat sushi – what is easily the most famous of all Japanese foods. There are plenty of choices you have when it comes to sushi surrounding Tsukiji Market, including famous guidebook places like Sushi Dai. I happen to just be scanning through Google maps (I really do this sometimes), and I found a place, a little away from the main tourist alleys, an in some back streets of the outer Tsukiji Market. When I saw a few photos of this place, I knew I needed to go there. I’m still not sure of the English name, but in Japanese 本種. If you had a Japanese Uncle or Grandfather, this is the type of sushi you’d be eating at his house. 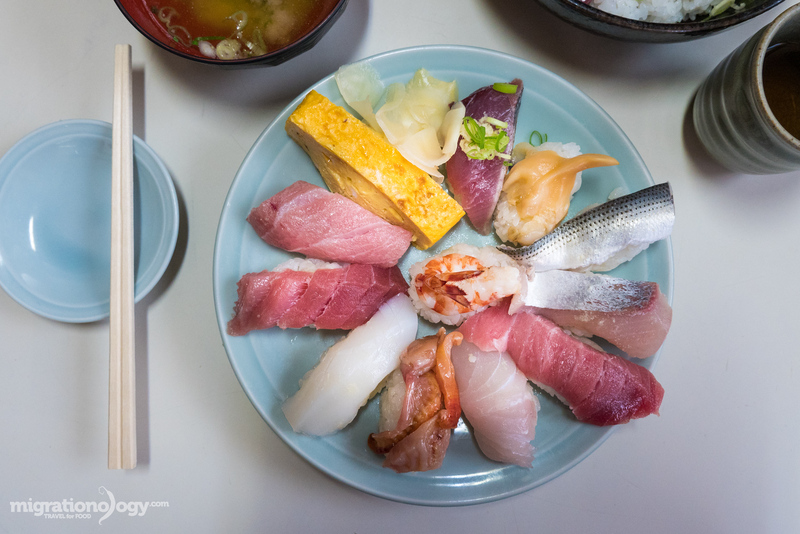 You order the sushi or the chirashi don (sashimi rice bowl) and you get thick cut slabs of ultra fresh fish and seafood over rice in a colorful display. It’s absolutely amazing, and one of the best sushi experiences I’ve ever had in my life (along with this one). A bite you’ll never forget! Have I ever mentioned to you how much I love tuna belly!!! It’s one of the most insanely melt in your mouth things you could possibly eat. 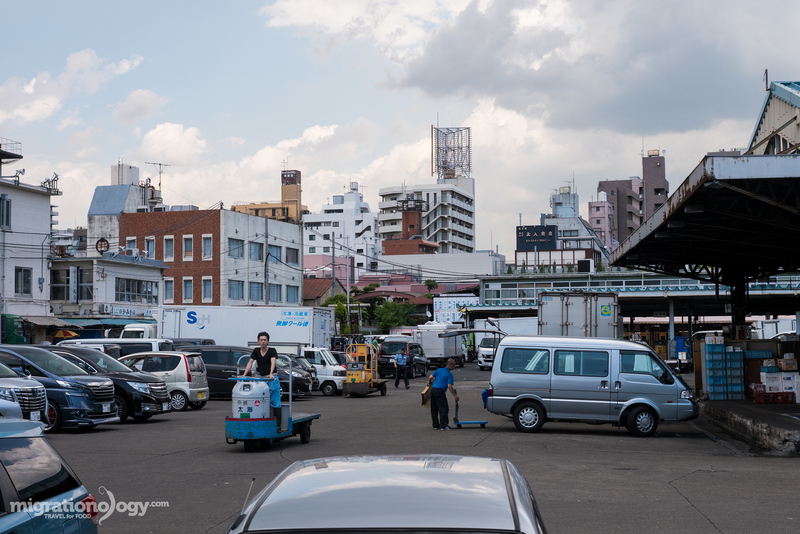 There’s this one section of the outer Tsukiji Market, right at the front on the main walking road, where you’ll notice everyone in the vicinity is carrying an ice cream cone (at least in the summer). There’s one stall that’s serving it up, and they have a variety of flavors, but I really like matcha green tea powder. The ice cream itself, as I’ve noticed many Japanese ice creams, has a strong milk taste, in a very good way. And this ice cream in particular is very fluffy and light, with a strong green tea flavor. I’m going to be straight with you – I don’t really like tamago very much. 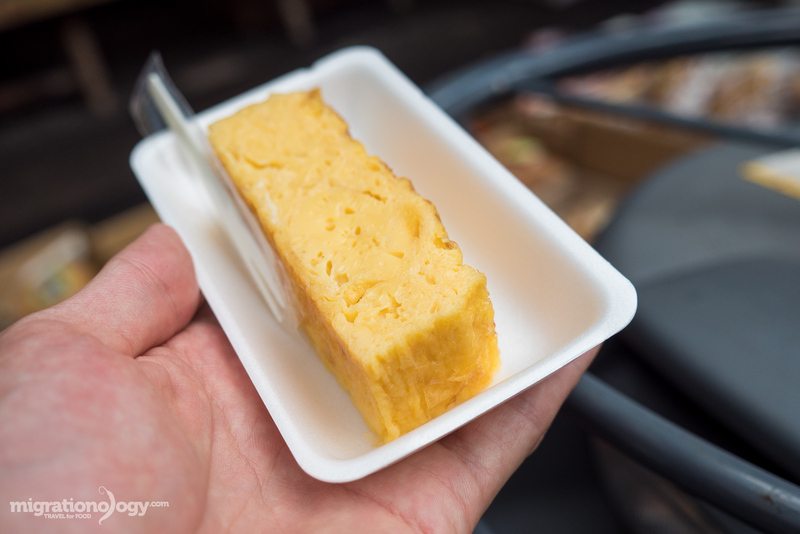 However, tamago, a Japanese sweet omelet, happens to be one of the most popular Japanese street foods to eat at Tsukiji Market. You’ll find about 4 shops in a row all serving these yellow egg blocks on styrofoam plates. I really appreciate the way it’s made and the art of it, but it’s just a little too sweet for me, while still being an omelet. Nevertheless, without a doubt it’s something you’ve got to try on your Tsukiji Market food tour. Approximately 3 years ago, I visited Tokyo and ate a blow torched seafood scallop treat from the same mane with something creamy and white included. During that time it was winter in Japan, and I had no idea what it was that I ate – but it sure was creamy and rich. Turns out, it was shirako – cod sperm – a winter delicacy in Japan. Unfortunately it was summer on this current trip to Tokyo, so no luck with the cod sperm. However he included lots of uni and a little crab claw in the mix (make sure you watch the video to see the blow torching action). Depending on the season you visit Japan, you just might be in luck! To finish off this Japanese street food tour of Tsukiji Market I headed over to the block of restaurants near the fish market auction. There are a few great places to choose from, and I was debating to try a well rated oyakodon (chicken bowl), but when I arrived they were closed, so I headed into Tenfusa Tempura, a fantastic decision to end the day on. 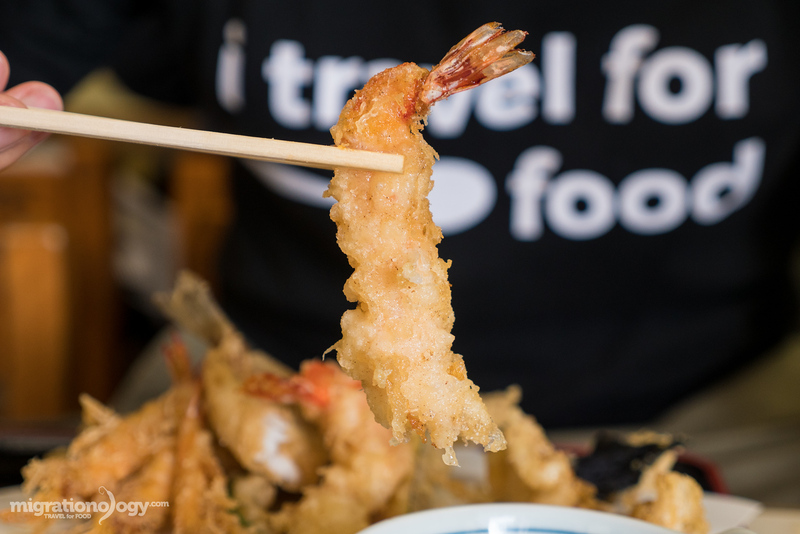 Tenfusa is a friendly and warm little restaurant serving fresh seafood tempura. They take their time to fry everything so it’s fresh and hot and extremely tasty. My wife and I split a tendon, which is a tempura rice bowl, and a plate of only tempura. The shrimp were outstanding, and I loved how friendly it is. By this time I was stuffed and very very happy. In this Japanese street food tour of Tsukiji Market I’m taking you on a thrilling eating tour of the outer market to eat some of the most amazing food and snacks. 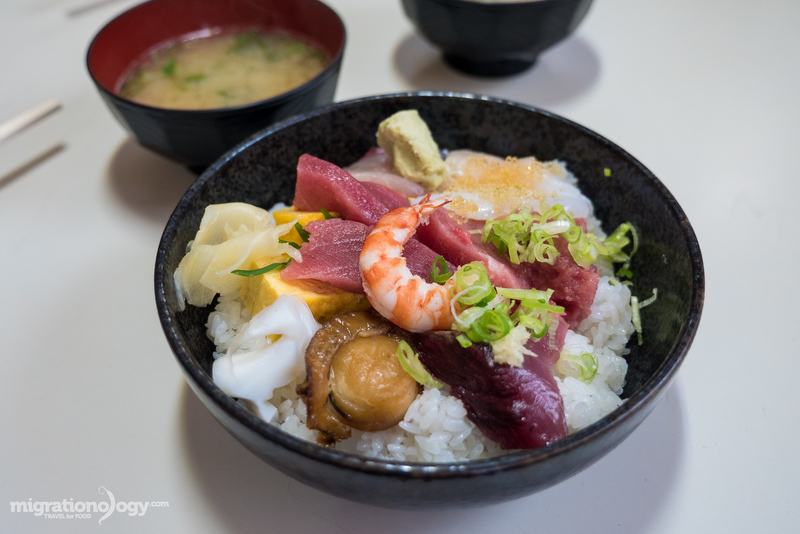 Tsukiji Market is a food lover’s dream, and when you’re in Tokyo, you’ll want to dedicate a day to exploring the market to eat seafood (and non-seafood too), and to experience a piece of this incredible culinary paradise. You’ll find all the places in this food guide on my Tokyo map here. Hi, your articles are amazing. all articles are helpful to travellers.now am the fan of your youtube channel also. Tsukiji market is one of my destination goals. Hopefully, in the next year or two, I can visit Japan and check this place out. And that oyster on the video is amazingly humongous and looking so fresh. That alone is a meal in itself. Tsukiji here I come. Mark, my husband and I have been watching your YouTube channel regularly for about two years and really love it! Thank you for so many great videos from all over the world. Your video around the fish market area of Tokyo was definitely one of our favorites, thought I’m also enjoying your recent Rwanda videos. Thanks for all of the great work! P.S. We also enjoy seeing Micah in your videos as well. I know Japanese food is a lot about seafood, which makes it difficult for a vegan it seems. A vegetarian can always eat Tamago and matcha ice cream 🙂 and perhaps sushi if there are vegetarian rolls and tofu. Do you have any tips for a vegan what to eat? I’m a vegetarian trying to eat more vegan and my daughter is a dead serious vegan, nothing from the animal kingdom passes her lips! I’ve long believed that good food, good eating, is all about risk. Whether we’re talking about All you need is love. “If more of us valued food and cheer and song above hoarded gold, it would be a merrier world.” “This above all: to thine own self be true, “I love you like a fat kid loves cake!” “One cannot think well, love well, sleep well, if one has not dined well.” “Ask not what you can do for your country. So many interesting choices! I am more of a sushi lover myself but the tempura also looks so tasty. Your job is wonderful . I enjoy and very appreciate your travel . Thank you . 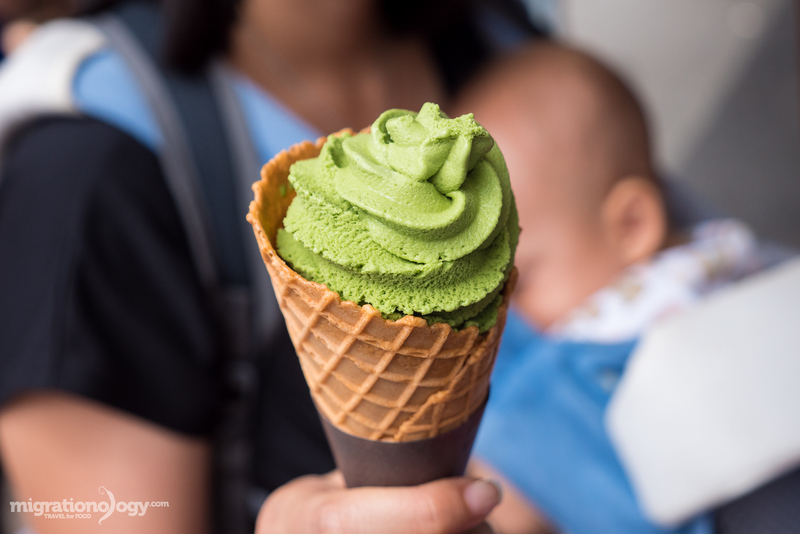 I ‘m a huge fan of ice-cream and didn’t know about matcha ice cream. I will definitely try it ! Great post Mark! Your videos have been paramount in coordinating my own adventures. Japan has always been a layover stop for me but I hope to make it a vacation stop soon enough! Thanks for posting! hi Mark, your blogs and YouTube videos have been such a great help in our planning of our recent November 2017 Japan holiday- Tokyo, Kyoto and Osaka. Thank you!!!! Tsujiki as well as Nishiki in Kyoto and Kuromon in Osaka were good places to try local produce and everything we had was amazingly fresh and good. One comment to people intending to try the beef or organ stew which smelled amazingly good when you walk past, it does say “no sharing” as you order. We ordered 2 bowls only( 4 of us) because we wanted to save stomach space for other yummy food. After purchase, there was an elderly Japanese woman in hand gestures telling us off for having a few mouthfuls off the two who held the bowls of food. She didn’t stop there, she made it her responsibility to hover over us and another couple who did the same, and physically pushed us (the ones who didn’t have bowls) in their off the street where their 2 narrow tables where situated. She made sure there was no sharing. That experience kind of spoilt the earlier part of the Tsujiki experience. We discovered that Japanese people in general are so lovely so this was an isolated case but for those who wants to try this, beware of the elderly woman in the stall. I knew I had to pin that family style nigiri and chirashi don place on my Google Maps as soon as I watched your video. I will for sure be finding this hidden gem! I’m so excited. I went to Japan for the first time early this year and finally I realised that all the hype is true! 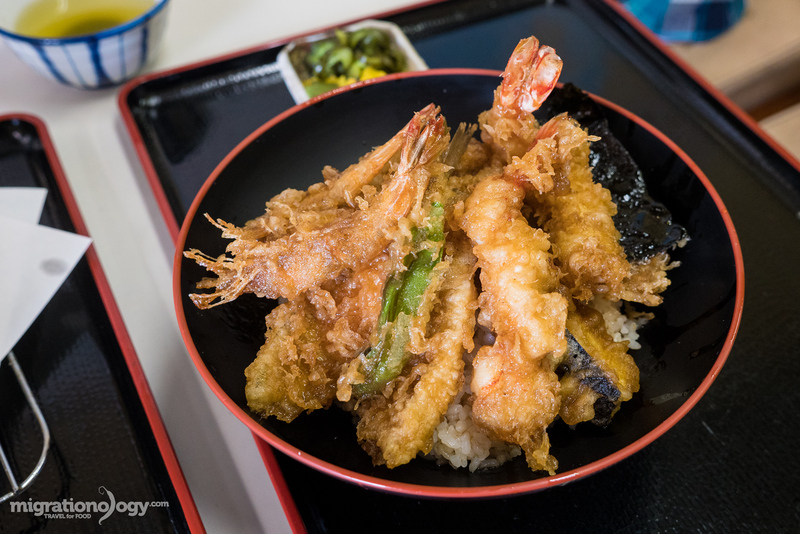 Japanese food is deceptively simple and yet so full of flavor! We went to Tsukiji market too and wish we came hungrier. There was too much delicious looking food to try. Probably our favourite moments iin Jaan were had eating and exploring Tsukiji Market. I concur with the Une, Raff tried his first ever fresh cut sea urchin from one of the stallholders and loved the creamy taste of the sea. And the sashimi was the most incredible I’ve eaten. Just wish I’d spotted a few of those giant oysters! Might just have to go back for those. Great post, Mark! There really is a never-ending list of restaurants to try! Being based in Tokyo for the better part of a decade now, I have tried most of these dishes. But not the corn fishcake! That looks very interesting and I’ll definitely have to try it next time I’m around the area! That picture of the organ soup reminds me of the time that I accidentally went to an organ hangover soup (haejangguk) restaurant in Korea rather than regular hangover soup. Eeek, I’m not so keen even though I’m Scottish and LOVE haggis! It’s just a bit too chewy for me. The sushi and the matcha ice cream, on the other hand, I would love! I wish I’d found this post before we went to Tsukiji fish market last month. Can’t believe I missed out on all this yummy food, especially the oysters! My partner and I were just watching your video about your food adventures in Japan and I just need to drop by here and say that you truly tease us with your passion for cuisine and travel! Japan is going to be our next travel destination together so we can stuff our faces with the same food mentioned here. Such an amazing post. I need to get out to Japan!! SO many of my friends have been lately and it seems incredible. Awesome post, haven’t tried the corn fishcake but it sounds interesting! Awesome stuff for a foodie. Love your photos, especially the last photos! I’d any day visit this part of This but looks like a great destination. What a giant oyster! My wife would love it! We are used to go to Japanese restaurants in Brazil, but the food seems to be a little bit different. Probably because they adapt some flavours to the local preference. But the sushi looks delicious! 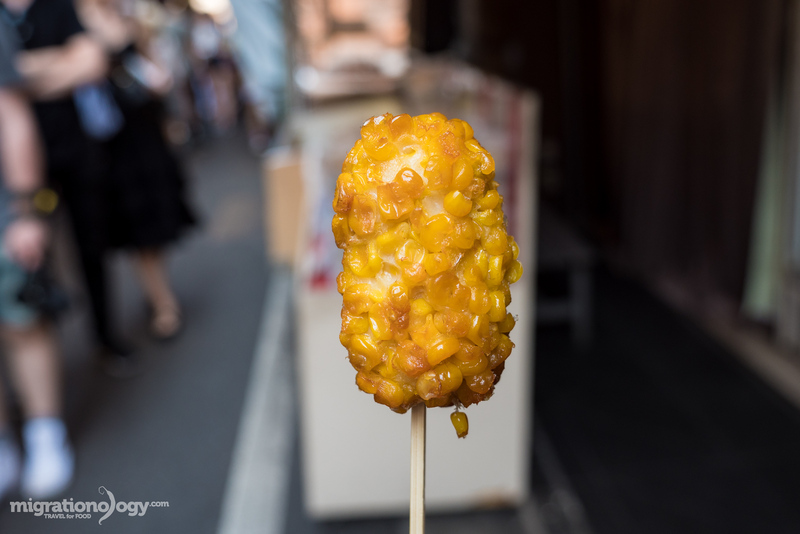 Corn fishcake skewer looks amazing . ???????? BTW heard Japanese people snake too, is that true? The Japanese certainly like their seafood – hopefully, there is plenty of selection for a landlubber like me when I get to go to Japan! Love it. Great blog Mark. I live in Tokyo and you covered things well. By the way, the sushi shop you mentioned (本種) would be called ‘Motodane’. Also, ‘tamago’ just means egg, but the sweet omelette would be called ‘tamagoyaki’ – literally ‘egg roll’. Keep up the good work. I always look forward to your Thai blogs (as well as others, of course). Hey Susan, awesome to hear from you, thank you very much. Excellent, really appreciate your helpful translations. wow…! so delicious dishes , i m hungry from all pictures, thank you for sharing the pictures. This make your blog so special! I’ve been to Tokyo for 3 times but never heard of Tsukiji Market. And of course I missed all of these. Wish I read this blog before. All of your recommend ones look YUMMY!!!! Gosh! I’m hungry. All the items are seen first time. But Tamago (sweet egg omelet), I wish to eat as early as possible. Thank you for this post which will be soon very usefull. We ‘re going to Tokyo next april and we are looking forward to testing japanese food ! I am getting hungry from all the pictures! I SOOOOO wish this had been up before I went to Tokyo last year! I need to go back now because I feel like I missed out on so much stuff! The Japanese certainly like their seafood – hopefully, there is plenty of selection for a landlubber like me when I get to go to Japan! Picking a favorite is pretty impossible here… awesome list! Oh wow this all looks so good! Now I’m really hungry, haha. Love your photography and the odd assortment of edible delicacies. I’m really not so sure I’d like the organ stew though but some of the other food looks great. Hello Mark, great pictures and videos about Tsukiji Market, i’ve been there and it’s truly amazing! I wished if i have met you and your wife before i left, i am waiting for your new videos and more pictures about Japan Tokyo. hello mark.how are you.its the best food japan. 本種 looks amazing. I will have to find it on my next trip to Japan. I know the markets are famous, but I always found the food around Tsukiji Market to be a bit disappointing. Maybe all the hype creates expectations that are too high. I love japan and Japanese food, but I actually found it was easier to find great sashimi in Taipei. Earlier today my friend said to me that we haven’t had sushi for quite a long time. Then, this post! I take this as a sign that I need to go back to Japan sooner than later. 🙂 Those are incredibly mouthwatering photos, Mark! If only my stomach can take as much as my eyes can. By the way, speaking of Tsukiji, I heard about the plan to move it to a new location. When you were there did anyone talk about this? Hi Mark, I have been to this place five years ago but I like some of your foods especially 1) Seafood Tempura 2) Blowtorched Scallop Seafood 3) Susie n Chirashi. After watching your video from YouTube I might try to visit again and have the same foods after my trip to Australia this coming December .???? excellent food tour and video. thank you so much. Impressive, love to watch and learn your food culture. It is a good idea when you do accommodation because it takes most of your budget. I rather spend money on food and sight seeing. Please do reasonable place for sleeping, no luxury, just safe and simple. Hope you do more in E and SE Asia, it is the next hot areas. How your Thai language? get good at it. Here is a little bit of Japanese sweet omelette history: eggs used to be really expensive in Japan. So having a fried egg or any kind of egg dish was really special. The sweet omelette is made with eggs and lots of the Japanese dashi, Katsuo soup stock and sugar, a bit of soy sauce, which would make the small number of eggs are used go further. The fact that it is or was at least special, made it one of the items served with sushi. Actually home made sweet omelettes are better in my opinion. I loved all the foods you tried. You really know how to get the best bites!! Next time look for tempura anago, a kind of conger eel. Boy, that is one of the best!! Really, really good! The food looks delicious, I love tempura but nothing raw. Last October in Tsukiji market, one of my friend got a dish of tuna right off a huge tuna fish, half hour later got really sick, high fever, diarrhea, vomit and nausea. She was a sashimi lover but now changed. All I’m saying is, there is no standard eating seafood raw when the sea is so contaminated. Health is yours to look after, just be aware. Love your videos. You were in Osaka, now you made it to Tokyo, mouth watering as usual, all the food I love. Hello Mark, I loved watching this Tsukiji Market in Tokyo…….. Thanks for sharing this with me….! I’m in love with these longer videos. So much good content. Watching you travel and explore all these places makes me want to do the same! and Tokyo is definitely my number one destination on my travel bucket list. So i’m wondering if you are staying any longer in Tokyo and are we gonna see more videos from there? I loved the way you described it “Grandma’s comfort” in the video! 🙂 Love all the street food that you mentioned here…especially the oysters and sushi, which I’d like to try! Another awesome food trip video Mark! I was surprised to learn that Chuka Soba was gutted by fire. Thanks for introducing them in your blog years back. Their ramen noodles were indeed legendary when I tried last time . I hope they get to reopen soon. Your photo of the tempura looks very yummy! Will check out Tenfusa when I get back to Tokyo. Hey Tiffy, yah that’s really sad news. Thankfully no-one was injured, but it’s a place that has so much history – glad you’ve eaten there too. Thank you and hope you’re doing well.